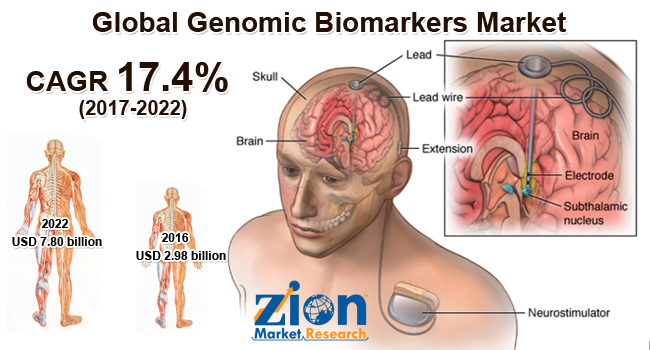 With the presence of a large pool of participants, the global genomic biomarkers market is displaying a highly competitive business landscape, finds a new research report by Zion Market Research (ZMR). Thermo Fisher Scientific, Roche Diagnostics, Myriad Genetics, QIAGEN, Bio-Rad Laboratories, US Biomarkers Incorporation, Almac Group, and Epigenomics AG are some of the key vendors of genomic biomarkers across the world. These players are focusing aggressively on innovation, as well as on including advanced technologies in their existing products. Over the coming years, they are also expected to take up partnerships and mergers and acquisitions as their key strategy for business development states the genomic biomarkers market study. Citing an instance, in September 2018, NRGene, a leading genomic big data firm, declared to have signed a partnership deal with RCK—an Israel headquartered cannabis manufacturing firm—for developing DNA-based biomarkers for strain detection as well as for breeding of medical cannabis. Reportedly, as per the terms & conditions stated in the agreement, both the partners can utilized NRGene's computational tools for creating biomarkers for commercialization. As estimated in this report, the global genomic biomarkers market stood at US$ 2.98 billion in 2016. Witnessing a tremendous rise during the period from 2017 to 2022, the revenue in this genomic biomarkers market is expected to reach US$ 7.80 billion by the end of the forecast period. The main indications available in this genomic biomarkers market are oncology, cardiovascular diseases, and neurological diseases. Among the three, the demand for oncology is relatively higher and the trend is anticipated to remain so over the next few years, notes the research report. “Growing occurrence of life-threatening ailments such as cancer, neurological disorders, and cardiovascular diseases are projected to leverage the potential growth trends of genomic biomarkers market,” says the author of this study. Apart from this, massive demand for genomic biomarker-based personalized medicines along with their widespread acceptance across the globe will further promote the genomic biomarkers market expansion. High costs and complex development process associated with genomic biomarkers along with strict laws regulating the application of genomic biomarkers, however, is likely to dampen the growth of genomic biomarkers market over the coming decade. Nevertheless, the escalating awareness about benefits of genomic biomarkers over other traditional diagnosis procedures along with humungous funding of genomic biomarkers is projected to unravel new growth horizons for genomic biomarkers market in the near future. This, in turn, will normalize the impact of hindrances on genomic biomarkers market, reports the study. Regionally, North America has been leading the worldwide genomic biomarkers market and is anticipated to continue on the dominant position in the years to come, states the genomic biomarkers market study. Lucrative demand for genomic biomarkers in the countries such as the U.S. along with the presence of a robust healthcare infrastructure facility in the region is the main factor behind the dominance of the North America genomic biomarkers market. The high number of market players being headquartered in North America along with the government funding of genomic biomarker activities is yet another significant factor that is supporting the expansion of the genomic biomarkers market in North America.